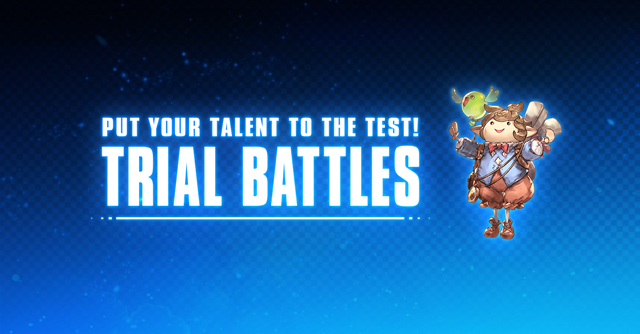 Trial Battles is a mode in which you can test your teams against various enemies. This mode contains exclusive Trial Characters that can only be used in Trial Battles. This mode can be found on the Home screen under Gameplay Extras. 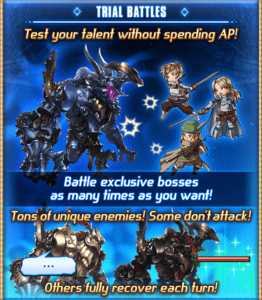 Trial Battles do not cost any AP to start and do not provide rewards upon completion. Battle actions that normally consume items can be performed at no cost in Trial Battles. Battle actions in Trial Battles are excluded from trophy progress contributions and other game achievements. 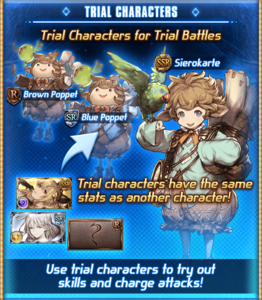 No rupies are earned if another player uses your summon in a Trial Battle. Battles automatically end upon reaching 1000 turns. Green Potions from Potion Distiller and Elixirs can't be consumed in Trial Battles. Instead, Trial Battles provide an infinite amount of Trial Elixirs. Trial Elixirs function identically to regular Elixirs when used in battle. There are a total of 6 different enemy variants in trial battles that differ depending on the name. Enemies are either Machina or Turret type with differing behavior depending on if they are Alpha, Beta, or Gamma type. Machina type battles contain one enemy. Before starting a Machina battle you will be prompted to select an element for the enemy you will fight. Turret type battles contain three enemies. Like Machina battles, an element for the enemies must be selected before starting. However, Turret battles have a unique option that allows you to fight 3 enemies with random elements. Alpha type battles contain enemies which do not attack and fully recover any lost HP after every turn. Beta type battles contain enemies which attack and fully recover any lost HP after every turn. Gamma type battles contain enemies which attack but do not recover HP. Alpha and Beta type enemies cannot be defeated. Battles with these enemies end by either retreating or allowing 999 turns to pass. This enemy's element matches the element chosen before battle. and Lethal HitInstant death for the victim. Fully recovers HP every turn. Can't be removed. 3-hit Elemental damage to random allies. Damage Cut reducing damage taken. Warning! Does not work for Plain Damage!. Elemental damage to one ally. Heals all enemies up to 700,000 HP. Duration: 3 turns on all allies. Trial Characters are special characters that can only be used in Trial Battles. Trial Characters' stats and skills are inherited from other characters. Trial Characters typically inherit stats from planned characters, but they can also inherit stats of characters that are already in the game. When a planned character is released, its stats may differ from the Trial Character's. Sierokarte inherits SSR characters' stats. Blue Poppet inherits SR characters' stats. Brown Poppet inherits R characters' stats. Poppets have unique Home Page birthday voice lines. EnglishThis is an unofficial, amateur translation. This page was last modified on 11 February 2019, at 07:21.